You know the moment. It happens right after you realize you did something you wish you didn’t. Maybe you broke someone’s trust and now the guilt is overwhelming you. Maybe you compromised your job in some way and now you’re terrified your world will come crashing down. I did something I shouldn’t have and I might not be able to fix it. I did something I shouldn’t have so I’m going to lose something important. Both of those things might be true. In fact, they often are. Actions do have consequences. We do lose things—all through life. Nothing is permanent, not even the most secure relationship. But none of this has to be catastrophic. Sometimes losing one thing opens you up to something else. It might be a lesson that helps you be more effective and happier in the future, or it could be a new possibility you never even thought to seek (like that dream you put off to work the job you just lost). Or maybe it won’t benefit you in any discernible way right away. Let’s call a spade a spade—maybe you’ll wish you went a different way, grieve what you lost, and then eventually let it go and move on. The point is you will eventually let go and move on. And because you’re a strong, smart, capable person, you’ll find ways to make this new direction meaningful for you. To make up for what you lost by gaining something equally important in the aftermath, whether it’s a new understanding of your strengths, a new idea of who you want to be, or a new opportunity to try again a little wiser. It’s hard to think that way when you feel your dream job slipping through your fingers, or you miss someone who made your life wider than it could possibly be long. What’s important to remember is that no matter what changes or slips away, you can still do something meaningful and fulfilling right from where you are. 1. The first is to not allow regrets. Make each decision with the fullness of heart and mind. Mistakes are lessons learned; they’re not meant to be regrets. 2. It takes time but I try to think of all of the positives that came out of that situation. 3. I trust that each experience is a lesson in the journey that I have chosen and embarked upon.I believe that we embrace the light and the dark and trust that we are exactly where we should be on our journey in this life! 4. I don’t attach myself to my emotions. I recognize the emotion and then let it go. 6. Breathe, reflect, learn from it, forgive myself, and move on. 7. I do it differently the next time, then there is nothing to regret. 8. Regret is a waste of time. There is only the eternal now. 10. Having some regrets is not a bad thing—they make you strive for better. If we didn’t have them we wouldn’t grow spiritually, either. It is your preconceptions of regrets that determine how they affect you, positively or negatively. 11. Sometimes life gives you circumstances that simply have to be grieved, with no way around that. 13. Feel it, review it, learn it, shed it. 14. Regrets are visitors in the guest house of the mind. They come and they go like all feelings. 15. Every time a regret crosses my mind, I put my mind to something positive in my life. 16. I believe that any bad decision can be rectified, depending on how much work you are willing to put into it. 17. Every feeling has a purpose related to survival. You can’t hope to “change” this fact because it’s part of life. You can instead learn to deal with feelings of regret by reflecting on them and learn from mistakes then letting go. Regret is useful. 18. 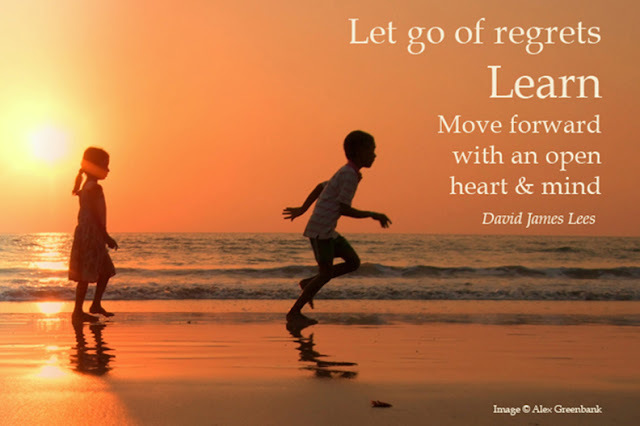 We may regret the time spent regretting unless we have learned from these regrets and make a more centered and peaceful now, where we create fewer regrets and more love. 20. Just live by all your heart, not by your head.